Even growing up I knew I was different from my family. I learned how to hide and disregard my intuition. When my family immigrated to the US we wore our difference on the outside —our skin. Horrors! Talk about sticking out like a sore thumb. You can’t hide or blend in with brown skin. I tried to fit in. But I never have. Never could. Trying to fit into a society where you look different is like being on a never-ending treadmill. But I still struggle with wanting to fit in and blend with normal people. Whoever those are, right? It’s hard when your Soul’s work doesn’t fit into traditional careers. Like, when, you don’t even have words for it. My guides have been pushing me for a while to step into my new work. I’ve heard them but I’ve been afraid. Afraid of what people will think of me. That people will think I’m weird, too “out there”. Like they’ll roll their eyes and say, “There she goes again, that strange one”. And conversation will fall flat and silent. Thud. I’ve stayed doing what helps me NOT feel different. It’s all good and great, don’t get me wrong, but I know inside it’s not what I’m REALLY meant to do. Do you struggle with that? Thank goodness for my guides. And their pushing. So today I decided I was done diddling about and chose to step into it. First, I visualized my “weird” but extraordinarily beautiful work. It was a crystalline multicolored sun. Second, I attuned to it like a deer cups its ears to sound, stepped towards and into it, like how you’d wade into a lake. Third, I let myself feel the discomfort and fear of how others might see me. I was surprised to feel loneliness, too, because I don’t know many people doing this kind of work. I breathed deeply a bit. Thank goodness for breath, right? Fourth, I imagined myself working from there. And that’s how I realized — felt and claimed — my work as lightworker as my Soul truth. My holy truth. I realized today that I’m not different. But unique. That talking about and teaching people what isn’t “normal” or “ordinary” is what I’m meant to do. Here to do. And it’s the only way I’ll be truly fulfilled. No matter who thinks what about me. So I’m going to do this every day. Step into and surround myself with the new vibration of my work. What’s your unique truth? 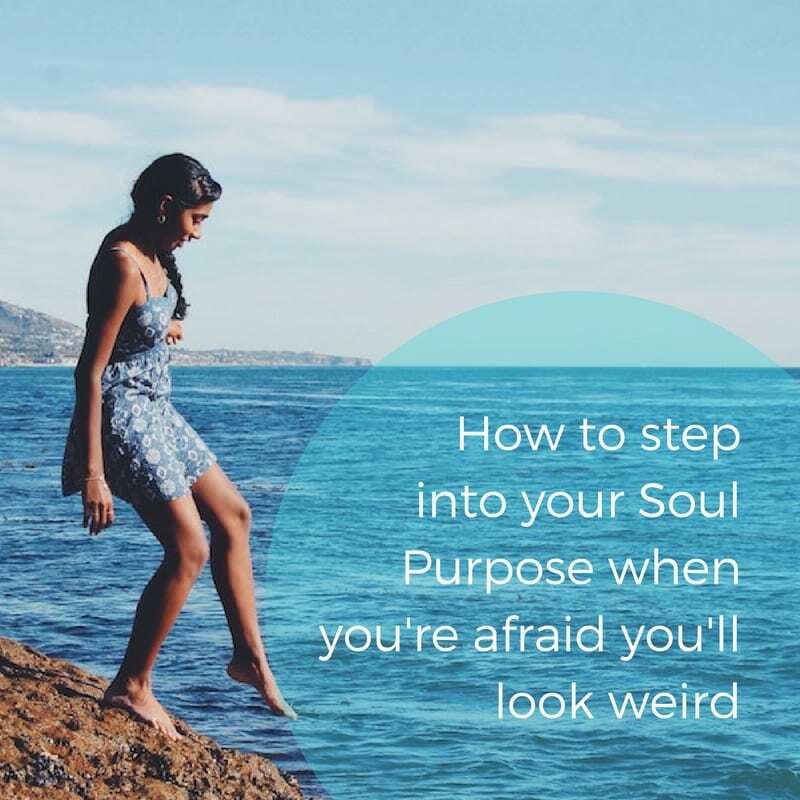 What’s your unique Soul purpose? Tell me below in the comments so we can share it with the world. And if you struggle with fear of looking different, I highly recommend the steps above as a practice. Did you like this post? Then please share with the links below.